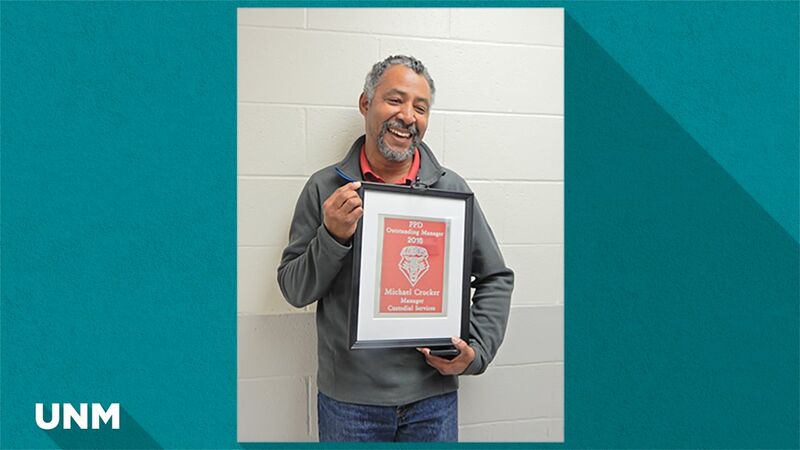 HSC Custodial Services manager Michael Crocker has been awarded the 2016 PPD Outstanding Manager Award. HSC Custodial Services staff celebrating their manager, MIchael Crocker. The break room in the UNM Health Sciences Center (HSC) Custodial Services suite was quiet and tense as the staff awaited an announcement from the Physical Plant Department (PPD) interim director, Shirley Mitchell, last week. Little did they know the announcement to be made was to present the first PPD’s Outstanding Manager Award for 2016 to Michael Crocker, manager of HSC Custodial Services. The applause was deafening and the smiles were large as the nearly 30 employees heard the news. Earlier this year, the PPD Recognition Committee established this award program to recognize a PPD manager that demonstrated the qualities of outstanding leadership, customer service, promoting a positive work environment and making a significant contribution to the success of their work group. In order to receive this award, nominated managers must have excelled in these areas in order to qualify, among other criteria. A cheerful personality, consistently communicating with his staff, accommodating them and “making work easier not harder” were all attributes used to describe Crocker on the nomination forms. Shirley Mitchell, interim PPD director, said “I’m happy to have presented the first PPD Outstanding Manager Award to the person who we felt exemplifies an outstanding manager." 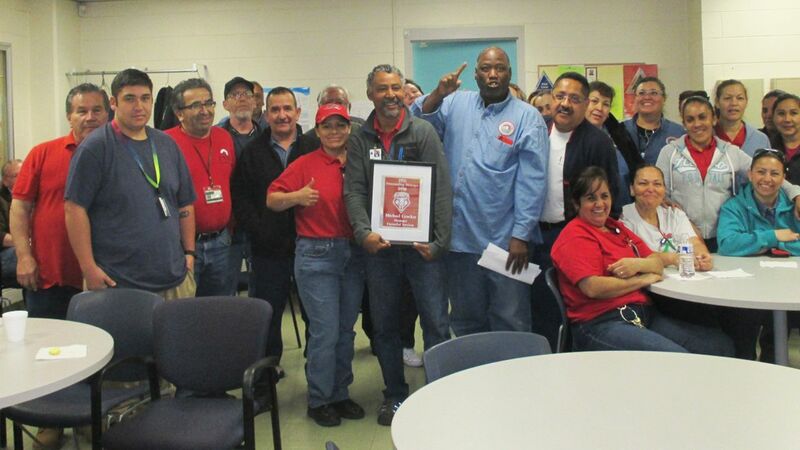 It was apparent during the award presentation that the staff in HSC Custodial Services believed their manager was deserving of this award, and they were truly grateful that he was recognized for his dedication to making this work unit thrive. Athena Salazar, administrative assistant in HSC Custodial Services, has been working with Crocker for a little over a year and said his presence has made a big difference in the morale of the employees. “When he came to this area, the entire group did a one-eighty. Before Michael, the custodians didn’t want to talk and mostly kept to themselves,” said Salazar. According to Crocker’s staff, things changed within three days under his supervision, and he showed them, almost immediately, that he was dedicated to listening and creating a space where everyone felt comfortable to share ideas, identify problems and rectify them, while having fun. Regular potlucks began, one-on-one meetings were implemented and personable “hellos” were given out. Many different staff members said that Crocker treats everyone equally and represents the “scales of justice” because he is fair, level-headed, and honest. Earl Ransom said that the environment is less tense and that Crocker will never leave his employees hanging. Kind-hearted, positive, and a "people-pleaser," Crocker is always out of the office checking on his staff and his customers, getting “down in the gutter” beside his staff. Crocker received a personalized award to keep, and in the coming weeks, a permanent wall plaque will be placed in the Service Building which will include his name as the recipient of this award for 2016. “First, I would like to thank all for the honor. To me this speaks more to the members of Custodial and PPD. We have great people in this department, working together giving their best, making UNM a better place for students, staff, and the State of New Mexico. Thank you all,” said Crocker.